available in a variety of dimensions to fit most Soxhlet extraction units. high purity glass binderless microfiber. They also feature a consistent wall thickness. Outer diameter measurements can be estimated by adding twice the wall thickness plus inner diameter. Wire forms from 8mm ID up to 90mm ID. Form lengths up to 330mm. Wall thickness from 1mm to over 3mm. Thimbles, crucibles, cups and tubes. Cellulose, borosilicate glass and quartz. Various levels of water filtration, including R.O. 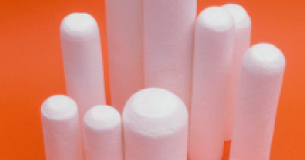 for superior purity in analytical and diagnostic applications. Lot selection, furnish verification and supply chain assurance. Cotton batch traceability "to farm" with unique commodity procurement services. Heat treating processes ranging from low temp, long exposure to flash and 1100°C muffle furnace treatments. Wide range of geometry including Lips, lids & tapers.